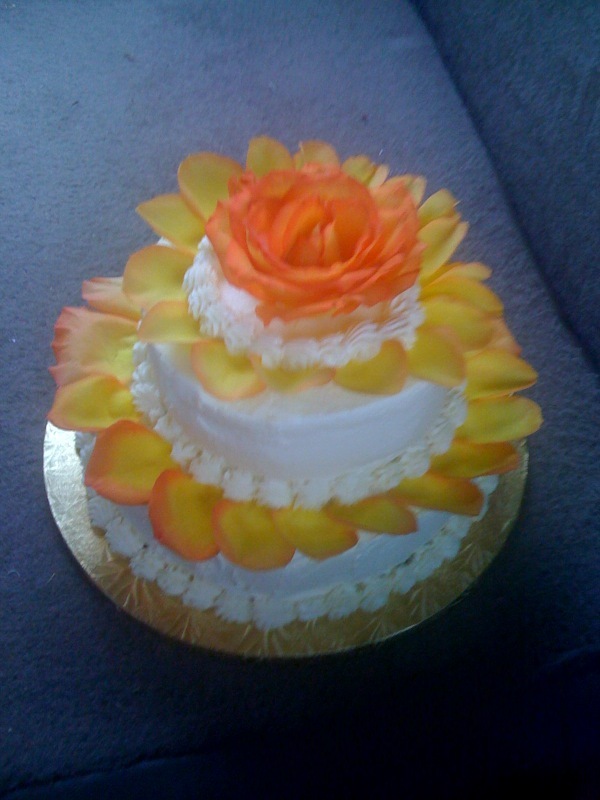 I’m pleased to say that both cakes for my mom came out wonderfully, despite some challenges along the way. My mom was in the process of moving into a brand-new townhouse and there was NOTHING there…not even salt! so I had to sally forth and purchase quite a bit of equipment and ingredients before I was prepared for cooking. And the oven thermostat was way off and nearly burned the first set of layers, so I turned it down somewhat and still nearly burned the second set of layers. I had to guess at the temperature for the cheesecake, too. But I managed to overcome both challenges and baked a 2-tier white chocolate butter cake for her retirement party, soaked with Chambord syrup to make a very moist, rich, flavorful cake.Â Between the two layers was Raspberry Silk Meringue buttercream (from Rose Levy Beranbaum’s The Cake Bible), which is a wonderfully intense raspberry buttercream frosting made by mixing a vanilla creme anglaise (custard sauce) with a very light Italian meringue, then adding unsalted butter and an incredibly intense raspberry conserve that I made by rendering 24 oz of raspberries down to about 8 oz of seedless puree, then adding a little bit of sugar.Â I could have eaten buckets of it. On the outside of that cake was a guava white chocolate ganache frosting.Â In the interests of honesty, I have to say I botched the frosting: I overbeat it slightly, so it was curdling a bit by the time I got it onto the cake.Â So it did not come out completely smooth.Â The guava didn’t come through at all, which I had more or less expected.Â So it was a light white chocolate ganache, still tasty but not as fragrant as I’d hoped. 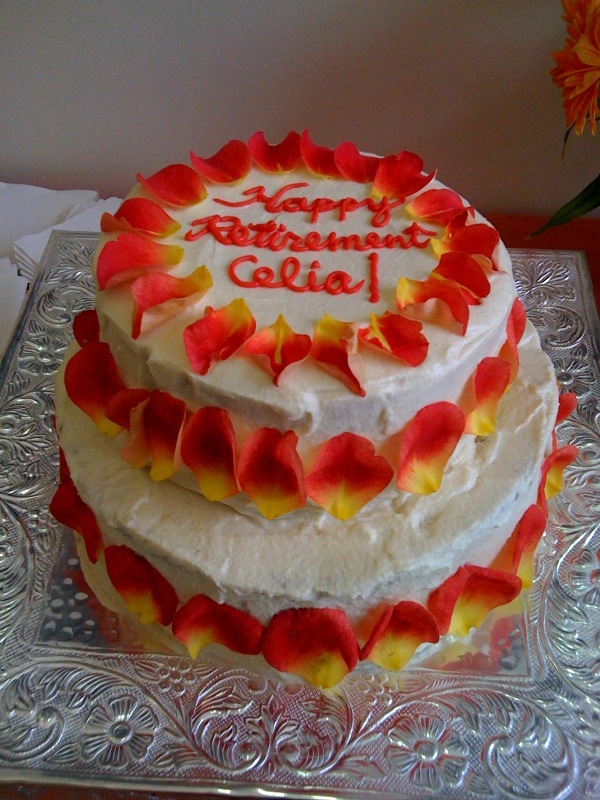 My mom's retirement party cake, decorated with bicolor rosepetals. Specs on the birthday cake: 1 tier of apricot swirl cheesecake, 1 layer of mango swirl cheesecake, with a lemon white chocolate cream cheese buttercream.Â The cheesecake came out perfectly – creamy and light throughout, without the slightest trace of cakiness or graininess around the edges.Â The secret, as Rose Beranbaum points out in The Cake Bible, is to recognize that a cheesecake is essentially a custard, and to cook it in a hot water bath to ensure even baking around the sides.Â You wrap the pan in a double layer of heavy duty aluminum foil (to prevent any leaks, especially with a springform pan) and then put it in a bigger pan, surrounded with 1″ of very hot water.Â This prevents the sides from overcooking.Â It was magnificent.Â Several people told me it was the best cheesecake they’d ever tasted! So I am pretty happy, heading home: mission accomplished! They’re both gorgeous. You’ve done your mom proud! 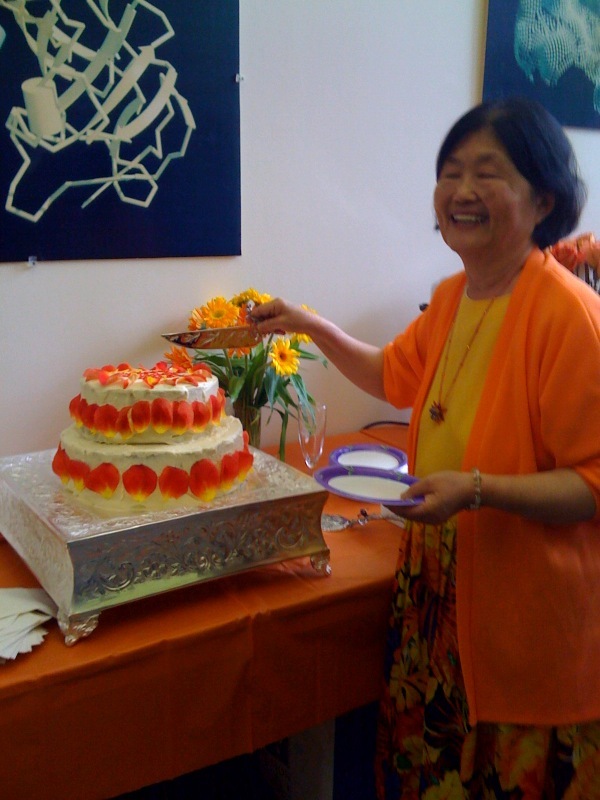 congratulations on the cakes — so gorgeous!